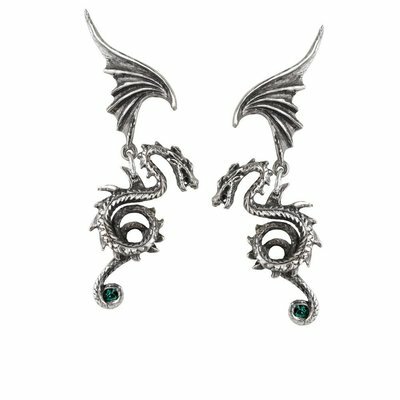 Dramatically elegant regal beasts, articulated as if flying familiars, staying in close company to their owner and attracting enviable attention; with Emerald Swarovski crystals. 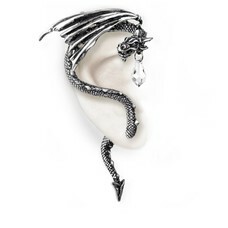 A dramatic piece that's sure to attract envied looks. A pair of pewter dragon stud earrings articulated at the wing joint and with emerald green Swarovski crystals; surgical steel ear-posts behind the wings. 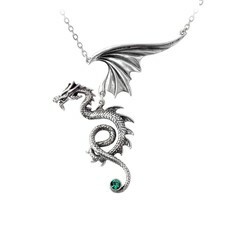 Width 1.02" x Height 2.6" x Depth 0.59"
Fine English Pewter with Swarovski Crystals. Surgical Steel Ear Posts.